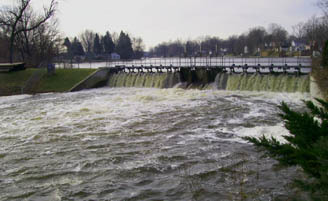 The ninety-foot-long Palmer Lake Dam, located east of the downtown business area, is a beautiful attraction during all seasons. It controls Palmer Lake, a man-made lake on the south side of Colon. The dam was reconstructed in 1997 of reinforced concrete. The lights were reinstalled upon completion of the work. In 1962, the Chamber of Commerce and the Junior Chamber of Commerce installed colored lights across the full length of the dam. Money was donated to the project by interested civic organizations, and local citizens donated their time to con­struct and install the lights. The lights are turned on automatically each evening around 6 o’clock and remain on until 10 pm. Four colors (blue, green, yellow and red) are used, and a special time-o-matic circuit control changes the colors every fifteen seconds. This entry was posted in General Info and tagged Dam. Bookmark the permalink.